While Mazda may have the official tie-in with the new Star Trek movie Into Darkness, it’s Audi — apparently not satisfied to be Tony Stark’s commuting vehicle — that may have Trekkies hot and bothered by pitting “newbie Spock” Zachary Quinto against “classic Spock” Leonard Nimoy in a new spot dubbed ‘The Challenge’. 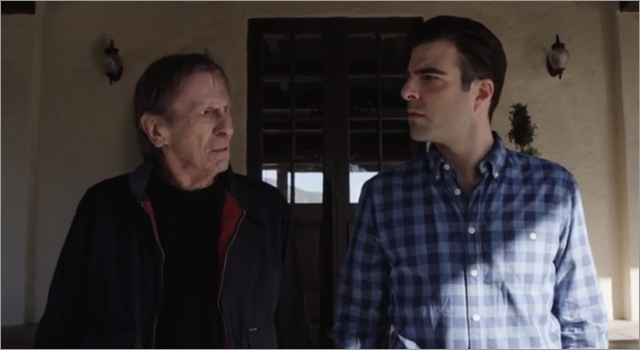 In the clip Quinto challenges Nimoy to a round of golf, and whoever arrives at the club last, gets stuck buying lunch. The video unfolds as a “not-so-subtle” comparison of Quinto’s Audi S7 versus Spock’s Mercedes. Nimoy even sings along to a few lines from his 1967 recording of “The Ballad of Bilbo Baggins” on the way. The ad was directed by comedy team Paul W. Downs & Lucia Aniello, aka Paulilu — the creative team behind the Dollar Shave Club ad – and produced by PMK*BNC. On Saturday night Paramount Pictures in cooperation with the WWF marked the beginning and end of Earth Hour by displaying a massive Star Trek Academy in the London sky near Tower Bridge. 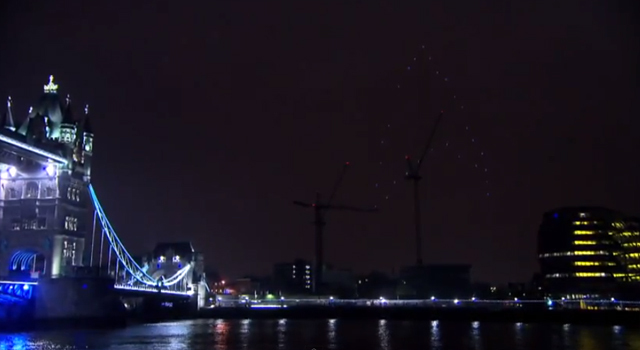 The 380 foot tall logo was created by the Ars Electronica Futurelab and Ascending Technologies using 30 LED-carrying quadrocopters (or 29, as two collide at 1:20 of the clip below, leaving one falling from the sky) powered by batteries charged in Austria using green energy. Check out the Ars Electronica blog post ‘Spaxels in London‘ for an in-depth look at the challenging setup of the project. If there’s anything I’ve learned from watching the original Star Trek, it’s if you’re beaming down to a planet in a red shirt, you’re probably not coming back. 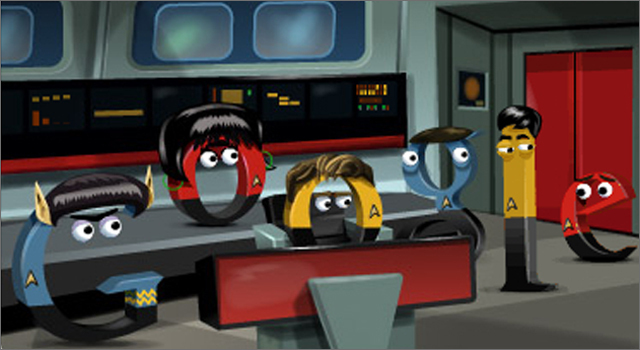 Google pays tribute to the red-shirted crew member in today’s home page doodle that celebrates the 46th anniversary of the airing of the first ‘official’ episode of Star Trek on Setember 8, 1966. The episode titled ‘The Man Trap‘, featured the crew of the Enterprise on a routine mission to complete a medical examination of a husband-wife archaeological team, but instead they unknowingly encounter a shape shifting alien. The mini story presented in the doodle is actually based on another episode from Season 1 titled ‘Arena‘. Captain Kirk must battle the reptile-like captain of an enemy ship, in order to save the Enterprise from destruction.